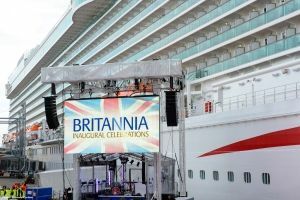 Working with their client Under The Radar, XL Video supplied outdoor LED screens and a multi-channel camera system for the naming of P&O Cruises’ newest luxury ship, Britannia. The Lighthouse R7 outdoor LED screen in action displaying the name of the newly christened ship. The ship, which is over 300 metres long, was officially named at a traditional ceremony in Southampton. In order to ensure the visiting dignitaries had an excellent view of proceedings, XL Video supplied a 7 meter by 4 meter Lighthouse R7 outdoor LED screen. XL Video also supplied five Sony HXC-100 HD cameras and 2 Bradley CamBall 2 robocams situated around the port location. The cameras covered all angles of the luxury ship, which bears a stylized Union Jack on its bow, as well as close-ups of the podium from which the traditional bottle of Wiston Estate British sparkling wine was launched to name the ship. One of XL Video’s large Grass Valley Kayak PPUs, engineered by XL’s Broadcast Director, Malcolm Whittall, was used to process all the camera footage, which was directed by Jerry Rosenfield. Live feeds from the PPU were fed to national and international TV broadcasters for their daily news programmes. A live satellite feed of the naming, originating from the PPU, was broadcast live on all of P&O Cruises’ ships in their fleet.